WANDO -- The number of visitors to an international seaweed expo under way on this southwestern island exceeded its target of 600,000 on Tuesday, organizers said. The second Wando Seaweeds Expo received its 600,000th visitor Tuesday morning, 19 days after the exposition kicked off for a 24-day run. 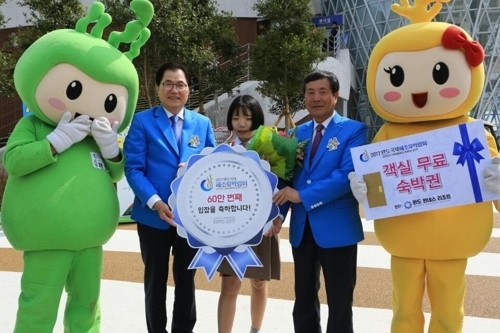 The organizing committee expected at least 200,000 more people to visit the expo until closing day on May 7, with the final attendance likely to hover above 800,000. An organizing committee official said the number of visitors includes some 27,000 foreigners, adding that the expo will be able to achieve its goal of attracting 30,000 foreign tourists. The expo opened on April 14 on the island off the country's southwest coast under the theme "Discovery of the Future Life, Seaweeds," bringing together about 1,000 buyers from 150 countries, including the United States, China, Japan, Canada and Australia. It is intended to shed new light on the maritime species' potential value not only as a healthy food but as a raw material for diverse future industries, including medicine and energy. Organizers hope that the expo will serve not only as a venue for exhibiting diverse food applications of seaweed but also as an opportunity to explore the possibility of developing it into a major industry with great growth potential. The expo has six event halls -- the Main Theme Hall, the Health Food Hall, the Industrial Resources Hall, the Ecology Environment Hall, the Aquatic Culture Hall and the Experience of Seaweeds Hall. It also features various workshops and forums to discuss new technologies and the results of the latest research on seaweed farming and the management of the coastal ecosystem.